At Jason Ree we believe in making love, not war. Developed in Japan in the late 1600's, the technique was created to make parts of the handle for the samurai's sword. 'Mokume' translates from Japanese to "wood eye" which refers to the Burl type of wood grain and Gane means "Metal". The making process involves layering coloured metals together under intense heat & pressure while hand forging the resulting billet of metal to create unique patterns. 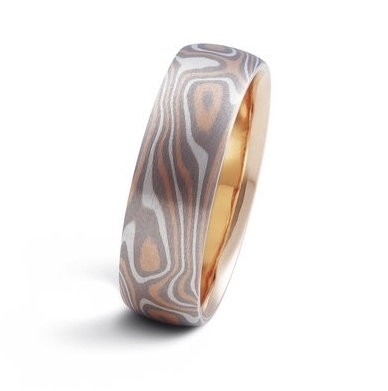 No two mokume rings are ever the same & beautifully symbolise the entwined love of two people.